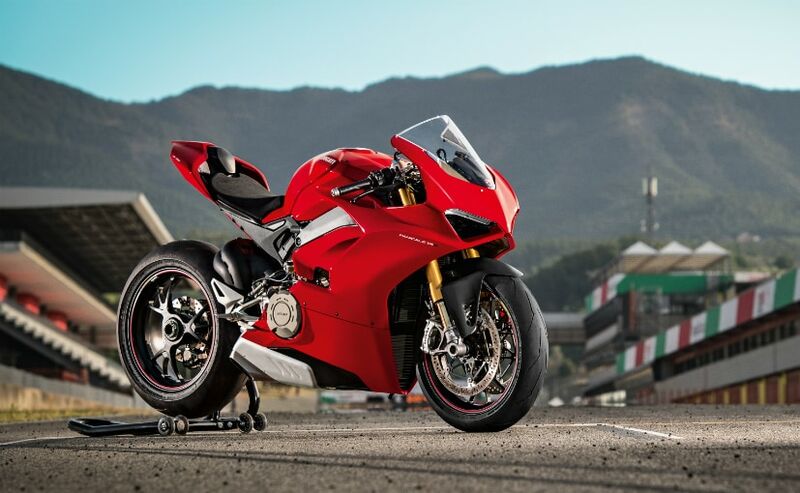 The Ducati Panigale V4 is the most powerful road-legal homologated superbike in the world, and it's the first production Ducati to use a four-cylinder engine. 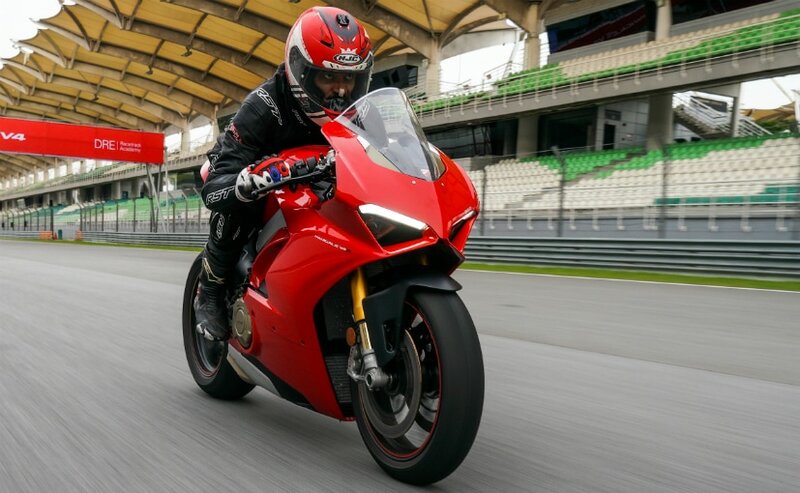 After spending a few track sessions with the Ducati Panigale V4 S at the Sepang International Circuit in Malaysia, we can say with conviction that Ducati has made a superbike which can make you feel like you have much better skills on a racetrack than what you actually have. 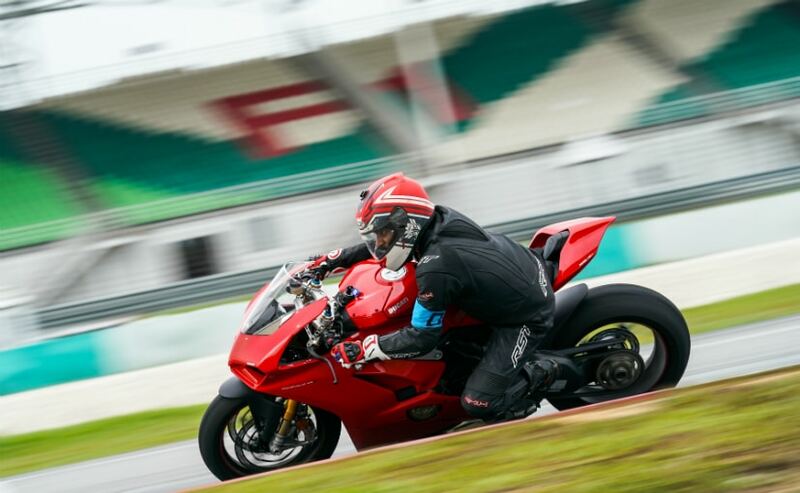 Yes, the Panigale V4, or the Panigale V4 S, in this case, can make a hero out of you on a racetrack, as we found out. 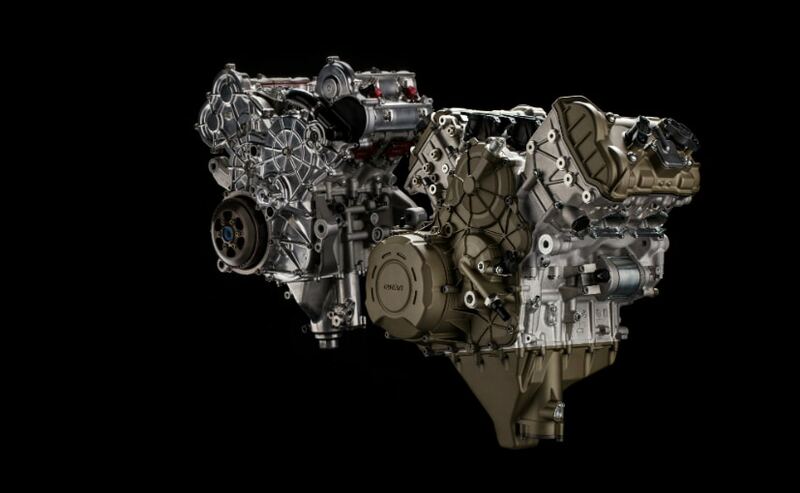 The four-cylinder engine of the Panigale V4 is derived directly from the MotoGP Desmosedici engine with the exact same 81 mm bore, but with a longer 53.5 mm stroke. The 1,103 cc, 90-degree, V4 engine belts out 211 bhp at 13,000 rpm and 124 Nm at 10,000 rpm from its four cylinders. It is now the most powerful road-legal motorcycle available on sale, and Ducati officials and engineers, as well as chief test rider Alessandro Valia, are confident that the Panigale V4 has the best of technology and advanced electronics tested over many hair-raising moments on the track to make it near fool proof when it comes to offering the riding experience of a near-MotoGP class bike. With a long list of technology and electronic rider aids, and actual MotoGP technology and experience applied to the engine and chassis, the Panigale V4 boasts of being a near-MotoGP machine prototype, built with a counter rotating crankshaft which is said to neutralise the gyroscopic and inertial effects of a fast moving sportbike. The result, it's said, is that it makes the bike more agile and more stable, even around a fast corner. And together with the performance, the Desmosedici Stradale engine also comes with long service intervals, with valve clearance inspection only necessary every 24,000 km. The Sepang International Circuit isn't what you'd call a simple racetrack; after all, it's a Formula 1 and MotoGP class track. A mixture of fast rights and lefts, double apexes, as well as crests and drops make it a far more complicated track to memorise and familiarise yourself with. 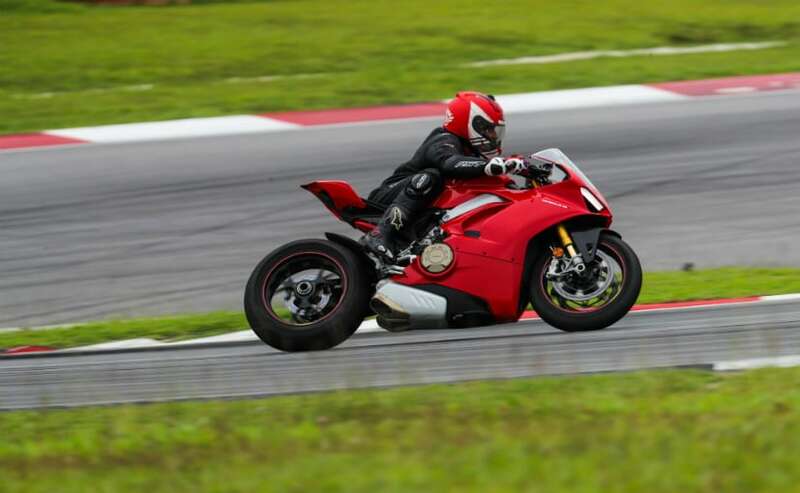 And the two long straights at Sepang give you ample run to explore the true potential of a race-ready superbike, like the one we are riding - the top-spec Ducati Panigale V4 S. Naturally, with so much power on hand, there's some trepidation before we test the bike on an unfamiliar racetrack. 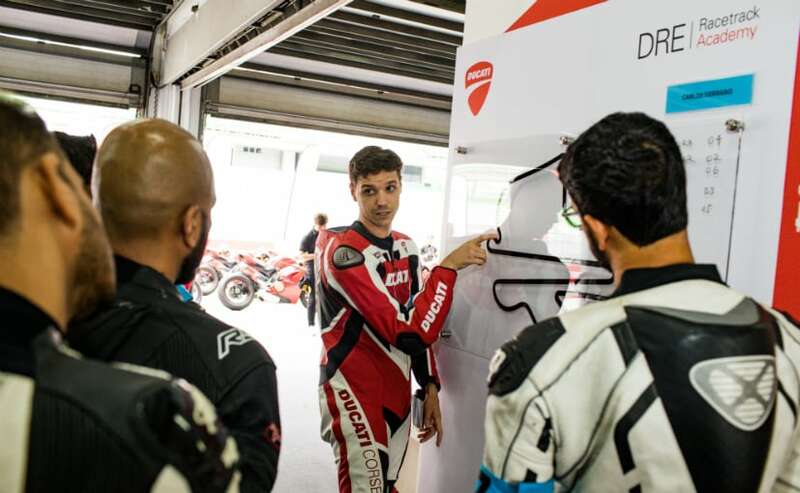 But we have some help, in the form of the Ducati Riding Experience Racetrack Academy. 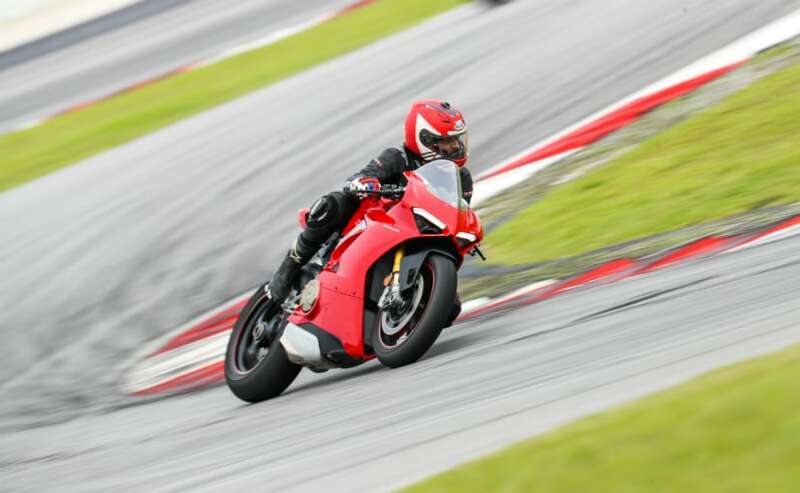 The very best Ducati instructors in Asia are leading us around Sepang, giving ample tips and feedback through five track sessions during the course of the day. Nevertheless, a new racetrack with a layout as complex as Sepang isn't easy to become familiar with, even though we have the very friendly Panigale V4 S to guide us through, with an electronics safety suite that is just like the reassuring words and comforting hand of my uncle who taught me, as a five-year-old, the art of balancing on two wheels for the very first time. 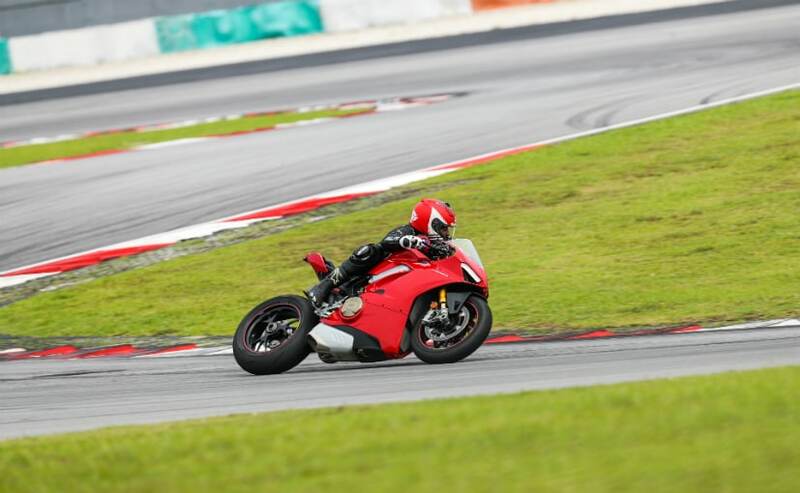 Sepang has two straights, and our group instructor Carlos Serrano took us through our first session with a steady pace around the lap, with me tailing him and trying to get a hand of what each turn (left or right) looks like. Turn 2 is a sharp left hander and I immediately feel my knee slider scraping tarmac, but there's no sense of how leaned over I am, or even a slight twitch from the bike as we straighten out and dip the opposite way into the sweeping right hander. The next sharp right hander is a second gear affair followed by a longish left and right which are fast third gear corners. What is immediately apparent is the ease with which the Panigale V4 S dips into each corner, whether it's tight, sweeping, or even the hairpins around the long straights. The cast aluminium front frame uses the engine as a structural element of the chassis, and has been designed based on Ducati's MotoGP experience as well. 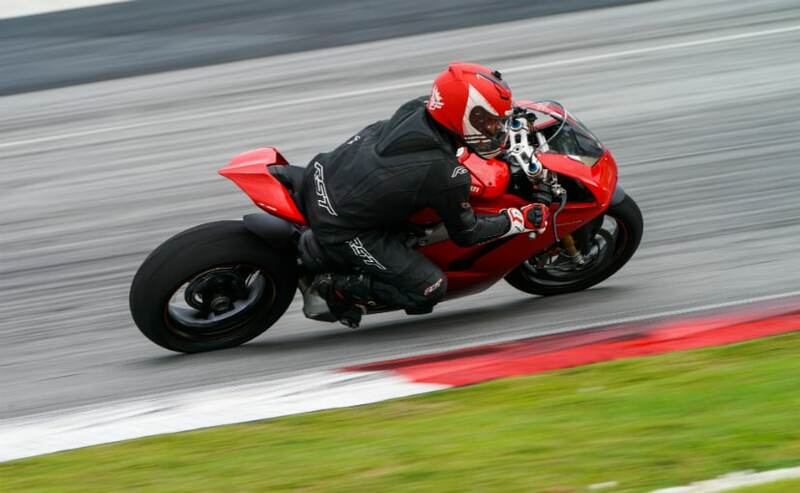 Before I shrug off my fear about the kind of performance the 200-plus bhp motor has between my legs, the Panigale V4 S has already made me familiar and comfortable with its perfect handling. This is not only due to the brilliant chassis and suspension, but also due to the hi-tech electronics suite the bike comes equipped with, as well as the super sticky Pirelli Diablo Supercosa SP race replica tyres. The Panigale V4 S ( ₹ 25.29 lakh ex-showroom), the version we are riding, comes with electronic Ohlins suspension, and together with the inertial measurement unit (IMU), the suspension continuously analyses bike behaviour and adjusts accordingly. The base Panigale V4 ( ₹ 20.53 lakh ex-showroom) comes with fully-adjustable Showa front fork and a Sachs monoshock, but I'd certainly recommend the electronic Ohlins set-up for prospective customers. Even though it costs more, it certainly makes for a riding experience that is more effective and immediately likeable. On the straight, fifth gear is enough to hit over 260 kmph, and it's time to bang on the gear lever, brake hard, and then take on the tight hairpin to again accelerate hard and fast on to the second straight. The world a fast blur, there's no time to check the speedometer to check the maximum speed, but the fast clutch-less downshifts (thanks to the up/down quickshifter), and hard braking, is without drama. The Brembo Monobloc Stylema (the evolved version of the M50 monobloc calipers) shed 200 kmph-plus speeds in an instant, and there's no twitch from the rear wheel, despite the aggressive downshifts. The traction control, together with the cornering ABS system, wheelie control, and slide control ensure you're always in control. The slide control also allows you to drift the bike approaching a corner at speed, but frankly, it was too much to even think of, and I lost out to courage, and limited skills. 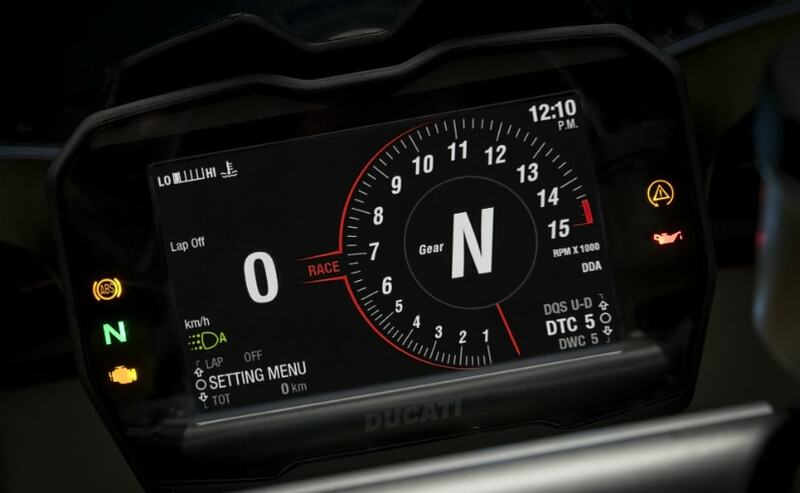 There are three riding modes in all - Street, Sport and Race, which can be adjusted via the full-colour TFT screen and easy to use toggle switches on the left handlebar. 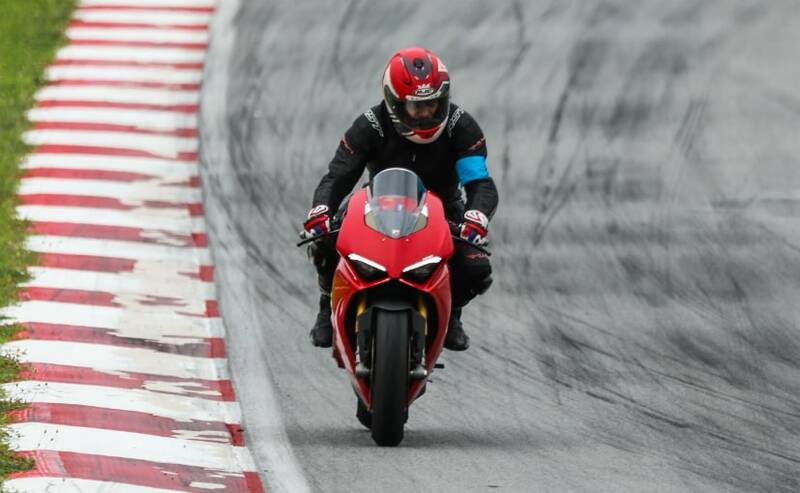 We're in Sport mode, and it's more than enough for our limited track skills to explore the Panigale's capabilities. And then, there's engine brake control, and the six-axis Bosch IMU works together with the quickshifter to take lean angles into account to ensure clutch-less shifts with impeccable use. The Panigale V4's electronics package processes data in a matter of microseconds, always ensuring there's no twitch from the bike or any sense of the rider feeling unsettled, in every riding condition. The result is - you, the rider, will feel like a hero on a racetrack, making you push yourself to your limits with the reassured safety net that makes you a smoother, faster rider. The new Ducati Panigale V4 S has that innate quality that makes a 200-plus bhp superbike very accessible and safe around a racetrack. Sure, it's not made for less experienced riders new to litre-class superbikes, and despite the state-of-the-art electronics package, one wrong twist of the wrist can make things go wrong very quickly; after all, all that power and torque over a wide rev range is not to be fooled with, or taken lightly, by any standard. 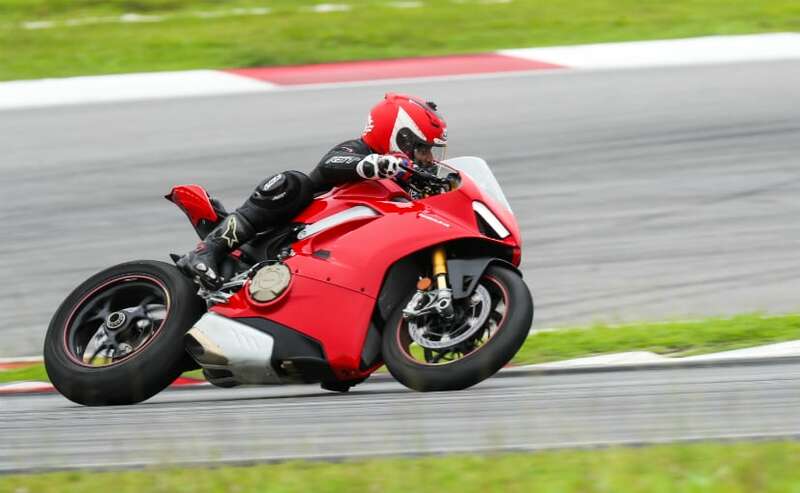 After five sessions through the course of a day at Sepang, it's clear that the Ducati Panigale V4 S is the best superbike I've ridden so far. Its compact dimensions (despite the long wheelbase), 195 kg kerb weight, and impeccable handling, make it feel like a smaller, middleweight sportbike. But that monstrous V4 has a torque curve which makes it livelier at all usable revs, and the V4 keeps pulling and pulling till you run out of tarmac, and courage. 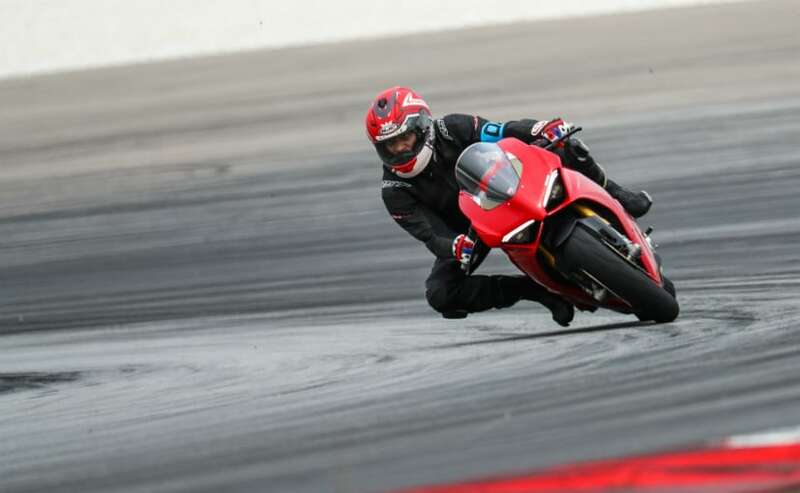 The 2018 Ducati Panigale V4 S will make you ride on a racetrack like you've never done before, if you're willing to push the envelope of your riding skills, and that is its biggest strength. Of course, the fact that it looks absolutely gorgeous in the flesh only adds to what it offers as a complete superbike package. As an everyday bike, it's still not clear how the Ducati Panigale V4 will be, especially in our traffic and road conditions. The Panigale V4 is a tremendously fast bike, and hugely capable, if you're willing to trust your instincts and the rider aids the bike offers. To me, it's the most fun I've had on any superbike, on any racetrack ever, and it certainly is THE best superbike that I've ridden so far.